Received an SMS purportedly from Vodafone today. Following the link you end up at the page http://i.three.com.au/VFMarketing/2011Q2/DataUsageCommsGp1011 and a 404 error message. So they are going to change the way they charge for data, but don’t really want to tell you what they are changing it to? And why do I get a Three URL? Doing a whois of the vfau.me domain I see that it was registered to Vodafone Hutchison Australia Pty Limited in March 2011. So probably is legit. I can see that this domain is running Yourls, the open source URL shortener. 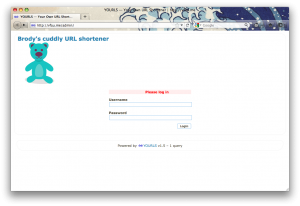 And, interetingly, looking at the admin URL I see that it is called Brody’s cuddly URL shortener. So, who is the afore mentioned Brody? And, thought I think their bear is kinda cute, is this really what you might expect on a corporate site? Can a VHA person please explain what this message is about, and fix your URLs. 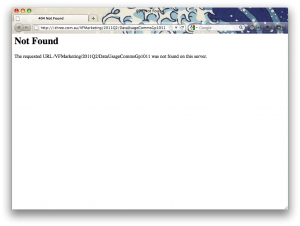 This entry was posted in Tech, Web sites and tagged bill, fail, Links, SMS, URL, Vodafone. Bookmark the permalink.